The Nissin Di466 Speedlite Flash Gun is a great flash for entry-level work ranging from sports to weddings, indoor and outdoor alike. It’s got very similar qualities to some of the high-end flashes. It has very good build quality and won’t let you down. It is made of plastic but since there are no moving parts it feels solid. It has a standard plastic mount unfortunately but it does mount perfectly every time. One of the nice things is that it doesn’t have that annoying button at the top that Canon’s have, which can get in the way. It turns 180 degrees one way and 90 degrees the other, which is a little less than the Canon but it’s okay. The Mark II came out recently but it doesn’t seem to have many upgraded or worthwhile features. Nissin Di466 Speedlite has a flash diffuser, bounce card, auto-focus assist and it can be controlled wirelessly by slaving it to trigger off a master flash. IT has ETTL, zoom, 24 – 105 and manual power settings. It’s a very simple and straightforward layout that’s easy to get familiar with. On the back it has mode, pilot, EV and levelers. 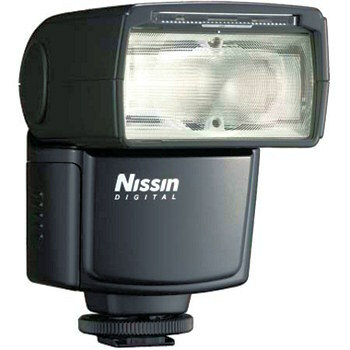 The Nissin Di466 Speedlite Flash Gun is reliable and consistent with the Canon ETTL mechanism. This is perfect for anyone in the market looking or an entry-level flash. It will cost you around $130 on eBay and about $150 – $200 retail. Many people that have this as well as the Canon 430 EX II still use this flash just as often. It’s a little warmer and can render flesh tones a bit better in some instances. It’s got a good refresh rate and battery life as well. Each battery is loaded in the same direction making it quick and easy on a fast-paced shoot. The snap-in magazine is easy to reload too. Some items available include a filter guide rail, wide-angle diffuser, quick follow zoom reflector, fill-in flash reflector and electrical contact for firmware upgrade. This might not be the best flash in the world, but many great photos have been taken with it and the results will never let you down. The Nissin Di466 Speedlite flashgun is highly recommended. For what it is, it’s a great entry-level flash.